This video is a short demonstration of tweak, the new editing feature for pantos on version 01.30.13. 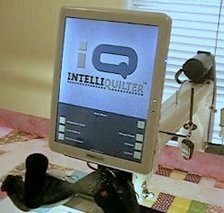 Touch the adjust mode button on the sew quilt page to find tweak and clip. Adjust mode replaces the clip/mark button. In this video I have tweak already selected. At the bottom left of the screen, there is an adjust mode button. To change to tweak, touch that button then touch the plus or minus sign.